Of 135 countries, representing 95.79% of the 2017 global population, for which information is available, 39 countries (15.48% of the population) require a prescription, including the United States; 10 (4.31%) formally required a health screening but no prescription; 36 (51.23%) have formal policies that do not not require a prescription or a health screening; and 50 (24.75%) have informal policies making birth control pills available without a prescription. Overall, 80.29% of the world’s population has access to birth control pills without a prescription. 1. Should prescription drugs be advertised directly to consumers? 2. Gallery of drug ads from Baldwin’s Nervous Pills (1883) to Anheuser Busch Malt Tonic (1918) to Thorazine (1962) and more. 3. Should all Americans have the right (be entitled) to health care? 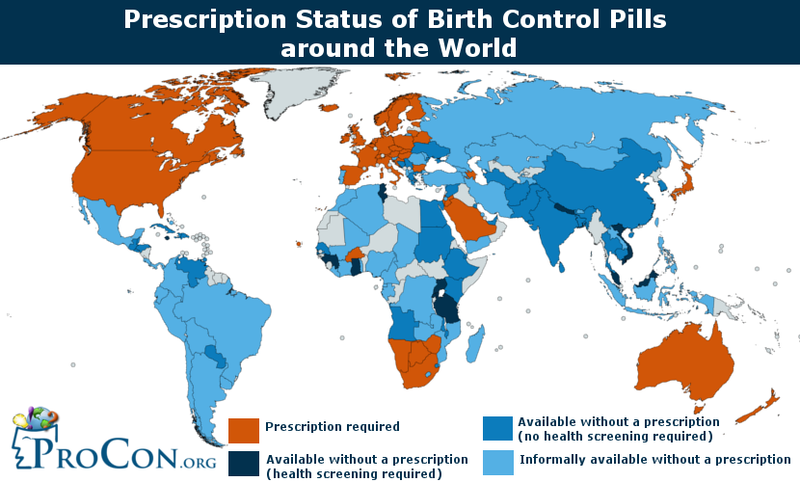 ProCon.org, "Prescription Status of Birth Control Pills around the World," ProCon.org. last modified November 20, 2018. https://birth-control.procon.org/prescription-status-of-birth-control-pills-around-the-world/.